From the UK to Canada, China to India, around the world, yoga is big business. In 2016, Americans alone spent US$16 billion on yoga classes and products. To put that figure into perspective – this is the same amount allocated by the World Bank to help the entire continent of Africa tackle urgent climate change challenges. But for many people, although they may well religiously attend their weekly yoga classes and enjoy sharing snaps of themselves mastering their latest yoga pose on Instagram, they might have less of an idea about where yoga itself (and the moves they are doing) actually come from. 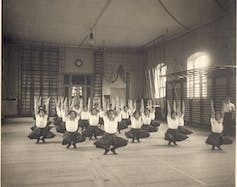 So while most people know yoga is firmly rooted in the Indian tradition, what they might not know is the modern history – of how yoga left the shores of India and travelled the world to be influenced by gymnastics, bodybuilding and other non-yogic practices to evolve into what it has become today. Take the postures, yoga’s most visible and popular component – known as āsanas in Sanskrit. These include downward dog, triangle pose and the tree – along with a whole other number of stretching and balancing positions. Well it turns out that similar postures can also be seen in Swedish and Danish gymnastic drills. This preoccupation with national fitness also came at a time when the invention of photography was taking off. This meant that yoga postures, or āsanas, that were being practised in India – which were notoriously tricky to describe effectively in words – could now be conveyed immediately and accurately through the new invention of photography. And cheap reproductive technologies brought yoga postures to the attention of the wider world for the first time. Inside and outside India, books, manuals and magazines began to showcase āsanas. In Europe and America people initially gawped at and ridiculed these poses as exotic or backwards. But the postures later gained popularity as remodelled Indian regimes of health and fitness. 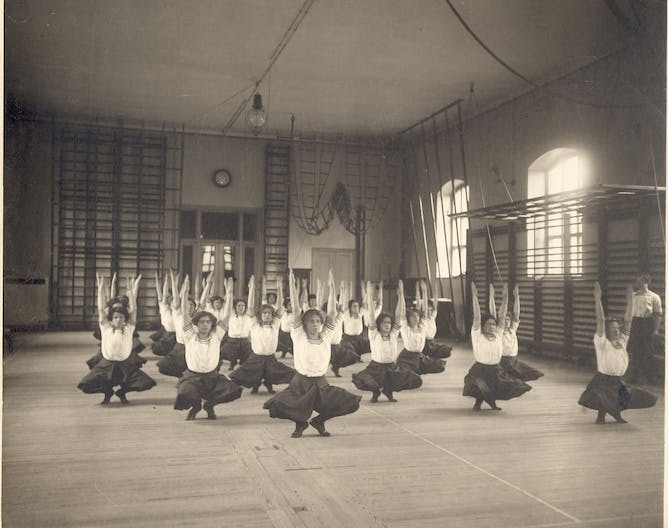 This was particularly the case in European and American women’s “spiritual gymnastics”. 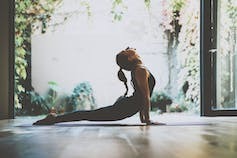 Often born on the margins of “unchurched” protestantism, these diverse methods involved various positions and movements of the body, along with rhythmic breathing, to access the “divine” – much as yoga does. And this modern entanglement of yoga with women’s spiritually focused exercise may help to explain why yoga is so popular worldwide among females today – with women making up more than 80% of practitioners in the US. But of course, it doesn’t just stop there: breathing, relaxation and various varieties of meditation have all played their part in making yoga what it is today. 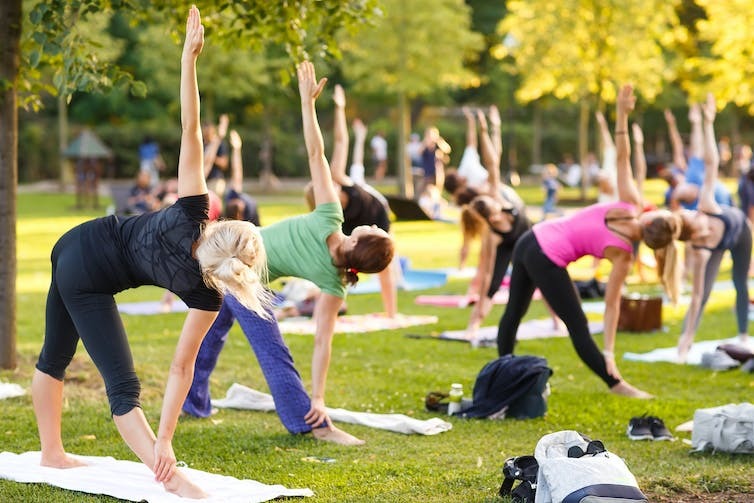 And as in the case of postural yoga – the usual yoga class you’d take at a gym or yoga studio that focuses on stretching and strength-building poses – these techniques have often become synthesised with nontraditional elements – like psychotherapy, western occultism, chiropractic, hypnosis, and forms of New Age religion. And this has also helped to take yoga in a totally different direction from it’s original roots. This has also happened with yoga in modern urban India, where the movement has undergone what one scholar calls “the pizza effect”. Just like the pizza’s modern journey from Napoli to New York and back, yoga has travelled far beyond its homeland, and has assimilated diverse influences – returning back to India with new flavours and ingredients.